Formerly known as the NYC Japan Street Fair, JapanTown is a festival of all things Japanese held on three different days during the summer to fall of 2010. We invite New Yorkers to once again immerse themselves in the rich culture of Japan through a celebration of Japanese "cool" culture, Japanese soul food, and healthy food. 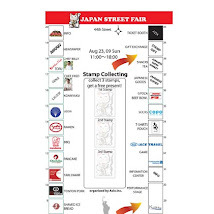 Visit us at www.nyjapantown.org. Photos from NYC Japan Fair 2009! Ajinomoto Frozen Foods U.S.A., Inc.